RANGELY — The first quarter score tells you about all you need to know about the game between the RHS Lady Panthers and the Debeque Dragons last Friday. In what was their highest scoring quarter of the year, the Cats jumped out to a 27-5 lead and never looked back. Solid team defense and sharing the ball on the offensive end was all in order as the Panthers strolled into the locker room with a commanding 47-13 lead at the half. In the second half the scoring slowed just a little as some of the younger players were able to get some valuable varsity minutes as they finished off the game with a solid 69-27 victory. Nine different players filled the scoring column for Rangely, led by Victoria Phelan who had eight rebounds to go along with her game-high 20 points. It was an entirely different environment on Saturday as the Lady Cats traveled to Meeker to take on a Cowboys team that was ready to put on a show for the home crowd on parent night. The first quarter was hard fought, but the Lady Panthers could only come up with seven points, and found themselves down by four as the quarter ended. The scoring picked up slightly in the second for Rangley, but unfortunately they were unable to gain any momentum going into the locker rooms and found themselves down by eight at the midway point. As they did in the first two quarters, Meeker added another four points to their lead and Rangely had quite a hole to dig themselves out of and only eight minutes to get it done. Although they did outscore the Cowboys in the final frame, it was by a narrow one point margin, and not nearly enough to get back in the game. The final score was 54-43 in favor of the Cowboys. Senior Hillary Hayes had a solid game for the Lady Panthers, leading the team with 14 points and nine rebounds. Audrey Hogan also found her way into double digits with 10 points to go along with six rebounds. 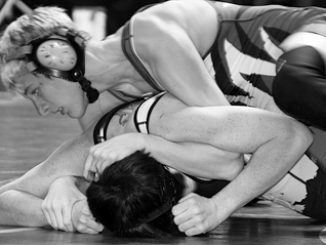 RANGELY — Devon Rose, who finished fourth at the state wrestling tournament, will represent Colorado in the Brute Scholastic Showcase this weekend.